Clinical trial results are being routinely withheld from doctors, undermining their ability to make informed decisions about how to treat patients, an influential parliamentary committee has claimed. MPs have expressed "extreme concern" that drug manufacturers appear to only publish around 50% of completed trial results and warned that the practice has "ramifications for the whole of medicine". 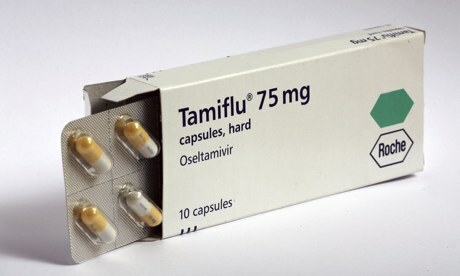 Their conclusions have emerged in a public accounts committee report which examined the Department of Health's decision to spend £424m on stockpiling the flu drug Tamiflu, before writing off £74m because of poor record keeping. The MPs found that experts failed to agree on how well Tamiflu works, but discussions were hampered because important information was held back. Richard Bacon, a senior member of the committee, said the practice of holding back results was undermining the ability of doctors, researchers and patients to make informed decisions about treatments. "Regulators and the industry have made proposals to open up access, but these do not cover the issue of access to the results of trials in the past which bear on the efficacy and safety of medicines in use today," he said. "Research suggests that the probability of completed trials being published is roughly 50%. And trials which gave a favourable verdict are about twice as likely to be published as trials giving unfavourable results. "This is of extreme concern to this committee. The department [of health] and Medicines and Healthcare products Regulatory Agency [MHRA] must make sure, prospectively and retrospectively, that clinical trials are registered and the full methods and results of all trials are available for independent wider scrutiny by doctors and researchers." The committee noted that an NHS National Institute for Health Research review in 2010 estimated that the chance of completed trials being published is roughly half. Trials with positive results were about twice as likely to be published as trials with negative results. Dr Fiona Godlee, editor-in-chief of the British Medical Journal, told the MPs that the pharmaceutical industry published more positive results than negative ones from their trials. She noted that the journal had published very clear summaries of systematic reviews of data on individual medicines or classes of medicines where, "when you add together the published and unpublished evidence, you get a very different picture of the quality and effectiveness of those drugs". A review by the non-profit Cochrane Collaboration into 20 existing studies into Tamiflu found it "did not reduce influenza-related lower respiratory tract complications" but did induce nausea. It is now receiving full clinical study reports from manufacturer Roche, which are being used to complete a further review of the effectiveness of Tamiflu. The results of that should be used by government, the MHRA and the National Institute for Health and Care Excellence to review the drug's use, MPs said. They also called on ministers to take action so that full trial results are available to doctors and researchers for all treatments currently being prescribed and carry out regular audits of how much information is being made available. Bacon added: "There is still a lack of consensus over how well the antiviral medicine Tamiflu, stockpiled for use in an influenza pandemic, actually works. The lack of transparency of clinical trial information on this drug to the wider research community is preventing proper discussion of this issue among professionals. We are disturbed by claims that regulators do not have access to all the available information. "The case for stockpiling antiviral medicines at the current level is based on judgment rather than on evidence of their effectiveness during an influenza pandemic. Before spending money in future to maintain the stockpile, the department needs to review what level of coverage is appropriate. It should look at the level of stockpiling in other countries, bearing in mind that the patent for the medicine runs out in 2016." An MHRA spokesman said the body would work with partners in the UK and in the EU to ensure greater transparency in the dissemination of clinical trials information.